Later this month, Romance Writers of America (RWA) will be holding its national conference in Atlanta, Georgia. A highlight of the event is the "Readers for Life" Literacy Autographing, a book signing featuring 400+ authors, to be held Wednesday, July 17 from 5:30 to 7:30 at the Atlanta Marriott Marquis. The Literacy Autographing is free admission and open to the public. Authors happily pose for photos and sign books which are sold to readers at face value with proceeds from the evening's sales donated to literacy charities. It's a win-win for everyone! 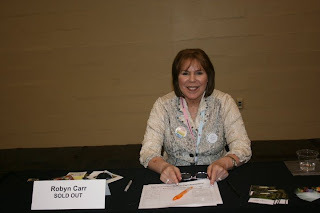 As I prepare for this year's conference, I can't help but think back seven years to the last time RWA brought its national conference to Atlanta. 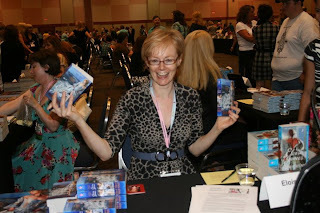 It was my first big book signing and I was filled with delight...and terror...at the thought of more than 400 romance authors in one room. I've since attended many of RWA's Literacy Autographings but, as I prepared to drive into Atlanta seven years ago, I had no idea what to expect. One thing you should expect is a crowd. A really big crowd! There are, after all, more than 400 authors in that room and most likely, more than four times that many readers waiting to meet them. People employ different strategies to make sure they get all the books on their list. One is to be in line outside the doors of the room where the book signing is held at least three hours before they open. At my first signing, I arrived about 30 minutes early only to discover that there were already about 800 people in line! Another strategy is to go straight to your "Top Five" authors and make sure you get their books. (I got the photo but missed out on the book I wanted from Christina Dodd. The penalty for not going there first!) Once that need is satisfied you can wander the rest of the room at your leisure. RWA helps by positioning the authors in alphabetical order by last name, so you know approximately where everyone is within the room, and listing who will be signing before the conference on their website. I copy the list and highlight the names of my "must buy" authors. Within that list, I note the "big name" authors, the New York Times Bestselling authors and featured conference speakers who typically will be positioned around the perimeter of the room...and who usually have lines out the door. If one of the "big name" authors is on your list, I strongly advise getting to them fast before they run out of books. If you're not a registered conference attendee, you won't have a name badge so why not make your own? There are likely to be readers at the signing that you've "met" online. Using card stock, make a name badge with your on screen name as well as your full name then pin the badge where it will be easily seen by others. You might be surprised by the number of people you'll meet! Here's a tip you may not have thought of. Address labels! Tuck a few in your bag to sign up for drawings or mailing lists along the way. So much easier, and faster, than searching for a pen and writing down your name and address multiple times. Another essential to take along with you is business cards. They don't have to be fancy; a plain card with the essential information is all you need and what better way to be remembered than to hand someone your card. You can have cards made quickly and inexpensively at places like Vistaprint or Staples or do it yourself on your computer. Easy and effective! Lastly, do not forget to take your smile. These are romance readers! They understand you, share your love of happy endings, know exactly what you're talking about when you mention the dreamy hero from a well-known author's latest book. Talk to the people standing in line with you. Introduce yourself. Chances are very good that they are just as nervous as you are. Are you going to this year's conference or Literacy Autographing? If so, please let us know so we can meet you in person. If you aren't going to this year's Literacy Autographing, you may be wondering what this blog has to do with you. Plenty!! You see, RWA National is one of the places where we re-stock the wondrous prize closet from which we pull books to send to you, our wonderful readers, throughout the year. So, now's your chance to have a say in what books you will have an opportunity to win here at The Romance Dish. Who are the top five authors from whom you would most like to win a signed book? What are the five current books (published in 2012-2013) of which you would most like to win a signed copy? That's all you have to do! And, to thank you for helping us I'll randomly select four people leaving comments (by midnight July 4th) to win a package of books from our current prize supply. I have to make room for all those new books we'll be bringing home from conference! I hope you have a blast :)!! Thanks, Savannah! We'll do our best to have a good time and share it all with you readers at home. Have fun, PJ. I'm so jealous. I've been seeing a lot of tweets from the authors and various bloggers discussing their plans to meet up in Atlanta. I would love to win a signed book by Lisa Marie Rice, Loretta Chase, Jaci Burton, Julie Garwood and Jill Sorenson. Books I'd like to win include Jaci Burton "One Sweet Ride," Jill Shavis' "Rescue My Heart," Jill Sorenson's "Freefall," Sabrina Jeffries' "What the Duke Desires" and Nicole Jordan's "Princess Charming." Jane, hopefully RWA will be in a city near you soon and you'll be able to join in the fun! Great list, Kim! I know a couple of those authors plan to be at the signing...maybe more! 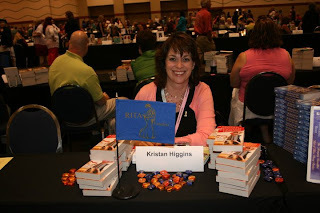 The top five authors I would love to win a book from is Debra Webb, Susan Elizabeth Phillips, Lisa Kleypas, Kristan Higgins, Tiffany Snow and Paullina Simons. The top books are The Faces of Evil (any book from the series) by Debra Webb, any book by Tiffany Snow, Rescue My Heart by Jill Shalvis, The Great Escape by Susan Elizabeth Phillips and The Price by Joan Johnston. Na, I have discovered some of my favorite books by stopping to chat with an author without a line at the RWA signing. I view an author I haven't yet met as a friend I haven't yet made. Have fun at RWA and take lots of pictures! I am on the wrong continent, so I can't attend lol. No worries, Antonia. I'll be busy snapping photos and sharing them here and at Facebook. I looked through the list of authors signing at RWA and **WOW** it's impressive. How do you choose just 5? That's an impressive list, Mary! I haven't read the Sophie Jordan yet but read and loved everything else on your list. Heather Snow is one of the authors I'm most looking forward to meeting. I love her books! Some of my favorite authors on that list, Pat as well as some of the nicest people around. I always love your conference posts and photos, PJ. They are the next best thing to being there. Thanks, Janga. 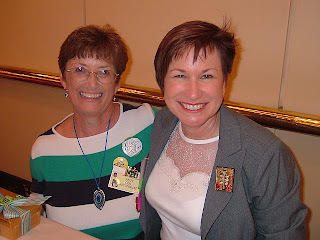 I'm happy that my posts and pictures are able to bring some RWA excitement to those who are not able to attend. My wish is that all readers could experience the RWA Literacy Autographing at least once. It's wild, crazy and jam-packed but so much fun! Great tips to remember! I am going to Atlanta-I am excited, but not ready yet. I don't know how it is already July. I only get to pick 5? Ok, Eloisa James, Terri Osburn (I've been following her since Squawk Radio and EJ's bb), Sherry Thomas, Jill Shalvis (who I just discovered), and Tessa Dare. I'm so excited for Terri Osburn and Manda Collins. It will be the first RWA signing for both. Terrific people and marvelous writers; they deserve every good thing that comes their way. 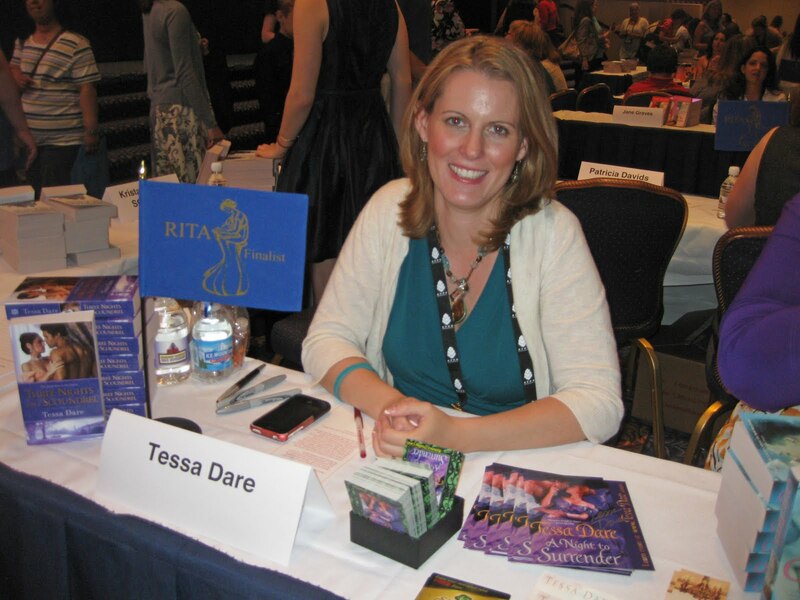 Tessa is, of course, one of my favorite writers and has been since back in the Avon Fan Lit days. Ditto for Courtney Milan. Lots of awesomeness came out of that EJ bulletin board, didn't it? I will be there for the whole conference. We arrive on Tuesday, I'll be sure to look for you. (and I'll email you my cell #). I wonder if Eloisa knows how many of us she inspired. Can't wait to meet you, Di! Oh, and I'll have chocolates. No purchase necessary! What a great contest. Have a wonderful time!!! Fav authors: Robyn Carr, Susan Andersen, Rachel Gibson, Kate Angell ane Deb Macomber. My book titles seemed to vanish in cyberspace, so here they are again: LOL. If Meredith Duran and Lisa Kleypas were there, they'd be on the list. Cheryl, just show up! Last time RWA was at the Marriott Marquis Atlanta the signing was in the ballroom on the level below the main lobby. I imagine it will probably be in the same place but you can ask at the hotel check-in desk or just ask anybody in the lobby who is wearing a RWA badge. If you decide to come, shoot me an email at theromancedish (at) gmail (dot) com so Andrea and I can meet you in person! Yes, shoot us an email, Cheryl! We'd live to meet you! I hope to get to one of these conferences one day. Have a great time and cannot wait to hear your adventures. Thenks for the great contest. My 5 top authors and it is hard to pick just 5 are: Susan Mallery, Bella Andre, Carolyn Brown, Jill Shalvis and Sherryl Woods. Thanks for a great article on the Literacy Signing, PJ. This will be my third RWA Conference, but, only my first time going to the Signing! All of your suggestions are excellent and very much appreciated. I'll be on the look-out for you and look forward to seeing you again. As for my top five picks, if I'm lucky enough to win; I'll be happy with whatever you choose. Excited to see you again, Flora! Barbara Delinsky, Janet Evanovich, any1 that writes comptempary or romance suspense, I guess. Have a great time at the conference... wish I could go too!!! My fave five authors...wow, it's hard to limit the number. I guess I'd have to say Stephanie Laurens, Eloisa James, Tanya Anne Crosby, Debbie Macomber and Jennifer Crusie. I would take any book (dare I hope for a recent release?) from them. What a neat idea you had to ask for suggestions for prizes...thank you! Wow this is HARD! I know I want Gunpowder and Tea by Margaret Brownley. Other than that, anything by Dorothy Love, Tamera Alexander, Colleen Coble, Miralee Ferrell. I love Karen Witemeyer but I have all of her books. :) Thank you and have fun!! PJ, as you know, RWA '06 was my first major book signing, too. I still think about the fact that we probably passed right by each other several times and didn't realize who the other was! I'm sure we probably did, Andrea! lol! I love my contemps. LOL. I would have to say any books by the same authors!! Here are my top 5 author! What a treat this is. thanks for this great post. I have won several autographed books even one from my favorite author Eloisa James, but would still like to meet her. So my list is authors I want that don't already have. Sabrina Jeffries, Lisa Kleypas, Christina Dodd, Monica Mccarty,Lynsay Sands. I do have several signed copies from authors. My most favorite one is by Charlaine Harris, I got to meet her several years ago and she was the nicest lady. Jeanine Frost-Halfway to the Grave.